Regina Benson discharges fabric in the snow. To say that Regina Benson is in touch with nature is an understatement. In Regina’s show Nature’s Voice at the Art Center Sarasota, Emma Thurgood has chosen art quilts that showcase the broad range of her surface design practice. These works represent particular views of the natural world, its landscape at a distance and close-up. Each work incorporates the use of dying, discharging, rusting and burning techniques within the execution of the piece itself. 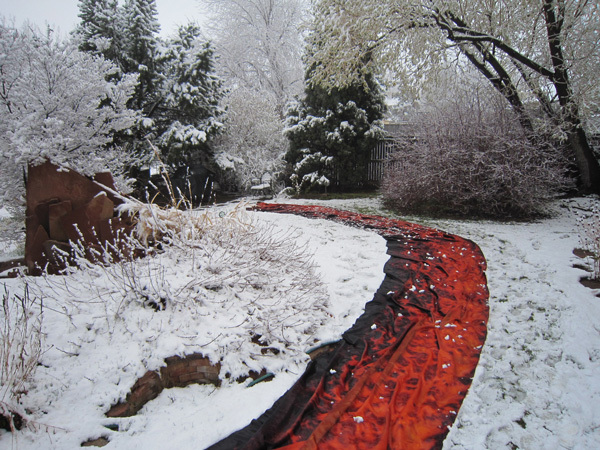 As an example, Night Bloom, a convex work, was created by pre-dying white cloth with several colors, including black, and then discharging directly on snow using rocks and pebbles as resists. 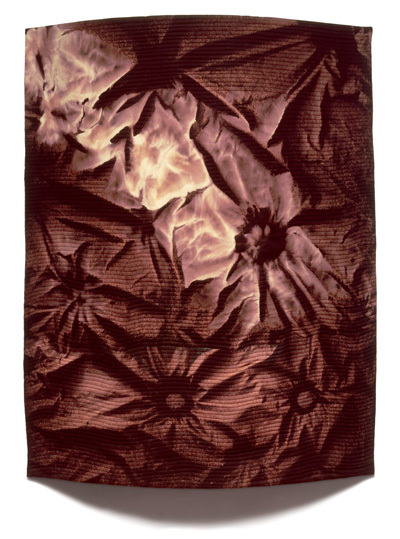 In Unearthed, a multiple convex curved work, she used found rusty objects, metal shavings and wire to layer rusty patterns on silk. 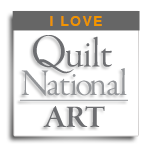 Within each work is a dimensional and architectural element that requires a specific armature that will hold the art quilt invisibly in a 3-d, concave or convex orientation. Creating textile art in concert with nature, Regina has re-designed ancient mark-making techniques to work gently with the earth, textile and art. She will illustrate the many ways she removes dye from her own surface-designed cloth and how she creates permanent rust-markings on silk, cotton and rayon cloth. 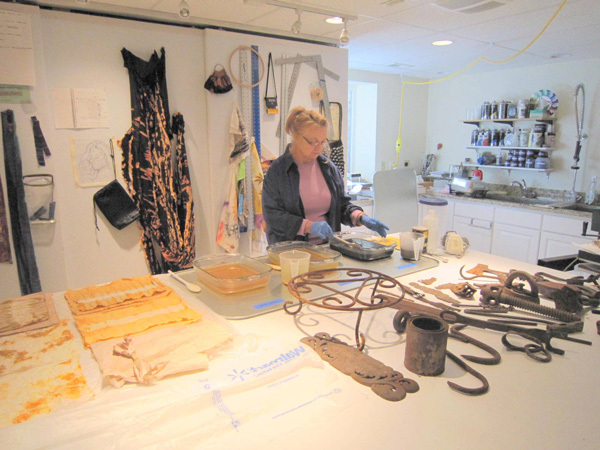 She will discuss how she pre-dyes cloth to create complex tonal designs in her discharge process, the resists she uses, and how various fabrics can be permanently rust layered and still retain fabric softness and pliability. Regina will also illustrate her spatial aesthetic and how she designs textile art that hangs invisibly in convex and concave shapes. She will have a “see and touch” table with samples of the actual materials she uses in constructing the internal supports. Using images of her own works that are juxtaposed flat and dimensional, Regina will further address the planning, surface design, fabrication, and materials’ considerations that must be involved in successfully floating works off the wall. Plan to attend this wonderful show if you are anywhere near Sarasota, FL.